Social Network ЁC PHP Social Networking System is a powerful PHP script designed to allow you to create your own Social Network! It uses a beautiful Bootstrap design, has integrated live chat, pages, albums, image uploading, powerful Admin Panel and more. It's powered by MySQL and PHP. - Provide excellent support with a fast response rate. - Patch and fix any bugs or broken content. - Help get you setup and installed! - Answer any questions you may have. Social Network is also very secure! - Secure Database that uses prepared statements so no SQL Injection! - Protects against CSRF attacks! - HTML Filter to protect against XSS attacks! - Built using the latest CodeIgniter Framework Version 3.0+ that has been tried and tested by millions of developers. - Passwords are encrypted using PHPass Library, standard bcrypt encryption. - Captcha enabled pages to prevent spam! - Each user can make posts to their Feed which their friends can also see. - Feed Posts can be made with the Feed Editor, that allows you to make emotive responses. - Upload Images directly from a post. - Upload Videos and YouTube URLs. - Tagged users using the @mention symbol. - Choose a location powered by Google Maps to let people know where you are. - Tell everyone who you're with by mentioning users in your posts. - Posts can contain Emojis! - Can turn off notifications for individual posts. - Save any post to your list of Saved Posts. - Edit/Delete any post on the fly. - Comment and sub-comment system. - Like any feed post. - Show albums of images with gallery viewer. - Frontpage will show posts from all your friends and pages you're a member of. - Shows Newest Users & Newest Pages. - Admins have access to All Pages and All Posts sections. - Saved posts displays any posts you have saved. - Sidebar shows your most recent online friends. - Can have multiple chat windows at any time. - Disable chat in Admin Panel. - View all chats in the Inbox, as well as reply/create new chats. - Clicking on a friend in the sidebar will load up their chat window automatically. - Custom User Roles allows you to specify what permissions your Students have. - Students can be managed by Teachers, including viewing all their classes, attendance and behaviour records. - Student Groups allow you to group your students together. - Student Groups have their own page where the teacher can post announcements. - Restrict access to who can view which Student Groups. - Users can register for an account using the quick and easy register page. - Users can also register accounts using their Social Network(Google, Facebook, Twitter) accounts, making it even quicker to sign up to your site! - Login System comes with a Forgotten Password page, to allow users to reset their password via email. - Prevents spam by making sure the email address is unique and valid. - Passwords are encrypted using PHPass library to make sure your data is safe! - Can disable registration from Admin Panel, as well as Social Login option. - User roles allow you to give permissions to specific users. - User notifications, including email reminders. - Profiles with customisable header and avatar sections. - Profiles contain all posts made by that user. - Other users can post directly to the user's profile. - Profiles show off the user's friends list and albums they have created. - Custom Fields for each user can be made in the Admin Panel to show up on the profile. - Any user can be reported, with reports being sent to the Admin Panel. - Users can create custom pages with the User Role Page Creator. - Each page has it's own members section, albums and events calendar. - Pages can be set to private/public so that only certain users can see/view them. - Members of Pages can have their Page Role set to Admin to help update the page. - Invite Members to join your page. - Albums allow you to organise photos and images better. - Events section allows you to post an Event on your page, with details such as time, location etc. - Events can be marked as attending/not attending. Post events to Page Feed. - Any page can be reported, with reports being sent to the Admin Panel. - Search Members by username, first name, last name, email. - User Settings area allows user to change their avatar, update their name and other information. - Change Password option in Settings page too. - Privacy settings which allow the user to set who can see what and perform what actions. - Add their social network profiles for other sites. - See page invites and friend requests. - User Role system allows you to assign specific permissions to users. - Set a default User Role in the Admin panel. - Admins have access to all sections of the site. - Create custom User Roles in the Admin Panel. - Change site name, logo and other settings. - Manage Members allows you to edit, delete and view Member information, such as their IP address, email and when they last logged in. - User Groups allow you to sort and categorize members easily. - Email Templates make translating emails much more easier by using our Email Templates option. - Email Members area allows you to send emails to all of your registered emails. Select by User Group, Username or All Users. - IP Blocking system allows you to block certain IPs from registering accounts and from logging in. - Manage Custom Fields for Users. - View reports of bad profiles/pages. - Allow users to switch between a language of their choice using our unique Language Switcher. - Supports any UTF-8 language! - RTL settings in Admin Panel. - Requires PHP 5.4 and a MySQL database. - Supports MySQL, Mysqli and PDO drivers. Pro School - PHP School Management System; Status Checker - PHP Site Server Status; Pro Login Content - CMS Secure User Management System; TITAN - Project Management System; Recipe Builder - User Management System; Documentation Builder; Pro Polls - PHP Poll Vote Script. Keywords: codeigniter, facebook, facebook clone, friends system, google plus, mentions, social media, social network, social networking, social platform, taggging, twitter, user posts, User profiles, user system. 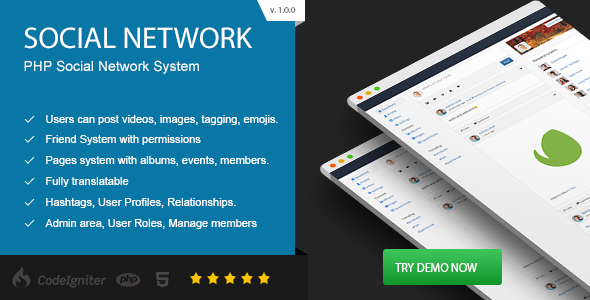 Premium CodeCanyon Social Network PHP Social Networking System 20886382 WordPress Themes, Website Templates, Mobile Themes, Flash Templates & Scripts from creative professional designers. Full details of CodeCanyon Social Network PHP Social Networking System 20886382 for digital design and education. CodeCanyon Social Network PHP Social Networking System 20886382 desigen style information or anything related.